If you're looking for our Darwen Days website, we're afraid you'll have to be patient as currently we've taken the site down in order to overhaul and update it. The Darwen Days website has been the same since it was first made in 2012, and since then we've filled the galleries with over 30,000 photos, creating a free historical resource for anyone interested in our much-loved town. We are aiming to create a whole new version of our website which will have lots of room to cater to our galleries as our collection of photographs grows and plan to launch this officially later on this year. In the meantime, you can find us as always on our Facebook Page, Twitter and Instagram, and email enquiries as always. You can also subscribe to this blog via email using the form on the left, so you will automatically receive any updates directly into your inbox. As we're sure you've recently heard, Darwen Tower has been closed because it's upper level has been declared unsafe. 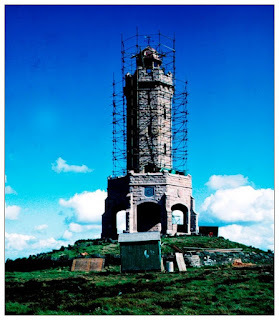 Friends of Darwen Tower has had an independent survey conducted on the Tower and it seems there is a lot more work to be done to ensure that our Darwen Tower is safe and secure for future generations to enjoy. Friends of Darwen Tower estimate that the costs could get as high as £100,000 and are working with the borough council to get actual costs together ASAP. DARWEN Tower needs urgent repair work, local historian Harold Heys has revealed. He and a small group of Tower enthusiasts have been monitoring the state of the Grade II-Listed Tower in the past few weeks and they commissioned a professional survey to check it thoroughly. A second survey by engineering professionals was conducted a few days ago. Major work will be necessary on the access to the top viewing platform. 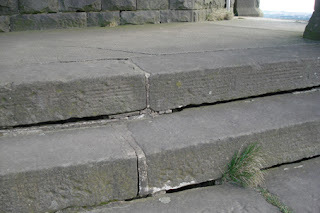 The concrete landing and iron supports below the metal steps are in very poor condition and parts of it are in danger of breaking off and falling down the spiral stone steps. 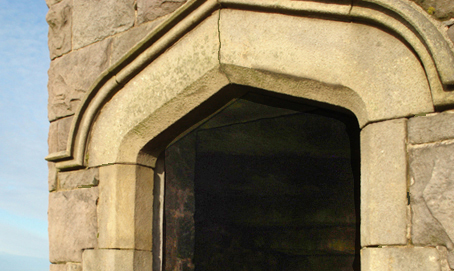 Doors and windows are missing, some of the sandstone is cracked and little of the original cement pointing remains. It all needs repointing and the foundations need looking at. Rainwater has been swilling down the inside stairs and there are cracks between the heavy steps around the base. Blackburn with Darwen Council have been kept fully in the picture and there has been some work recently on clearing the drains. The tower was built in 1897-98 to mark the Freeing of the Moors and Queen Victoria's Diamond Jubilee. There have been two major renovations – in 1947 and some 25 years later after an appeal led by Cllr. Dr Bill Lees. Renovation work now is expected to take two years and is likely to cost a lot of money. The WEC Group spent about £30,000 replacing the dome after it blew off a few years ago. The track to the Tower from Bold Venture is also in a poor state. 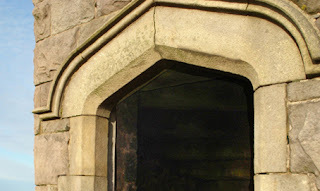 • The photos, taken by the investigation team, show (1) the ornate lintel above the entrance to the first viewing platform cracked and much of the pointing missing and (2) some of the gaps between the heavy steps around the base. Who knows what lies in the darkness below? Welcome to the latest addition to the Darwen Days community where you can read about all the latest news and events from the team behind Darwen's biggest non-profit history group. You can comment on individual posts and contact the team on Twitter, Facebook and email. Eh-up Cocker? Darwen Days now has a news blog!